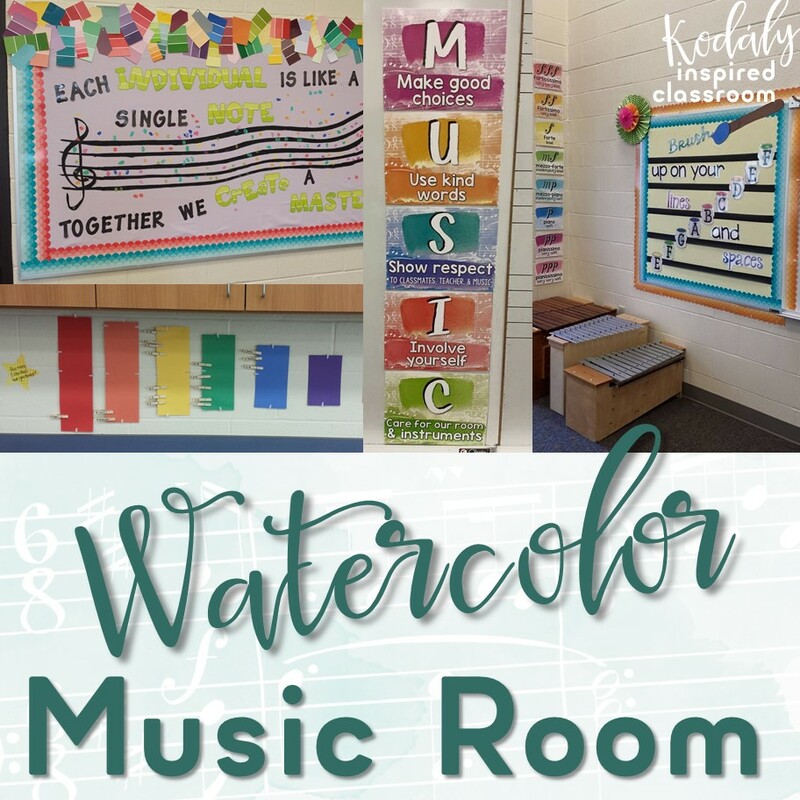 I am so excited to let you peek into my music room! But first, I need to give a shout out to Michelle from The 3AM Teacher for my new blog design. I have been loving the watercolor look since Winter and when I thought about my room design and my blog, I knew I wanted them to both be in a watercolor theme. Colorful. Calming. Pretty. I hope you think so! I have found it really helpful to have a lines and spaces bulletin board of some sort up in my room year round. This is helpful especially for my older kids who are playing recorders. Someone in my "Lindsay's Kodaly Inspired Classroom - Share Group" on Facebook suggested the title "Brush up on your Lines and Spaces" for the title of the board and I loved it! I actually put this board together twice. Originally I had it backed with white paper and it was just a little too boring. I thought about splattering it with paint, but I didn't trust myself and thought it might become a huge mess, so I ended up finding a really pretty yellow fabric from Hobby Lobby. I had a 40% off coupon and I think it took a yard and a half to cover it. 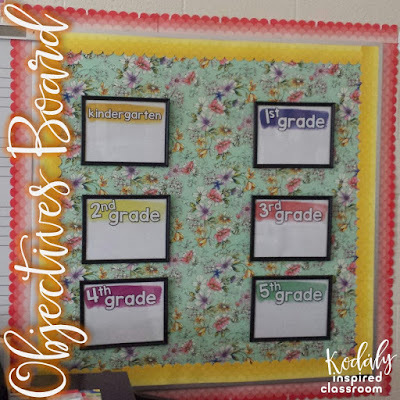 I got the scalloped bulletin board boarder from my local school supply store. You can find it online though here. I used black streamers for the lines. 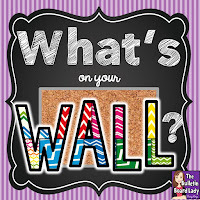 The printables for this board can be found here. On my other square bulletin board, I backed the board with a pretty floral fabric that had a watercolored look tot he flowers. The fabric is so pretty, but busy, so I wanted something simple for this board. I usually have my Solfa Street on this board, but I thought it might be a good place to post my objectives this year. I bought these really cheap document frames for $1 each from Dollar Tree and printed off some mostly blank pages that had the grade levels on them. I use an expo marker each day to write on the board what the objective for each grade is. My administrator loves this. I did have laminated cards that I tried using last year, but I would forget to change it out. These I can keep up for a while as I am preparing or presenting a concept. I might write "Use my singing voice to match the pitches" or "Move to the feel of the music" when I am prepping a concept. After the concept is presented I can be more specific "I can sing (or read) songs with sol-mi". "I can move to the beat of the music" or "I can clap patterns with ta titi and rest". Find these blank objectives pages here. The colors of mine are a bit different because I wanted them to look good on top of this particular fabric. The ones in the file match (as close as possible) to the grade level binder covers in my watercolor teacher binders set. I love to dress up the side of my file cabinets. I taped butcher paper to the side, trimmed the edges and added border trim (from the same line as the scalloped borders). I love the posters I found "It's RUDE to EXCLUDE!" and "Don't decide that you can't before you discover that you can". Both are very applicable to my kids and my room. Sometimes when we play singing games some kids get left out, or some students don't take hands nicely. This poster is a great little reminder for some of my kiddos. The other one is for when things get "too hard". I have really high expectations for my kiddos and some of them have very low self esteems because of their home lives. I am always encouraging my kiddos to try and telling them that I believe in them. The posters came from my local teacher supply store. You can also find them online here (It's Rude to Exclude) and here (Don't decide you can't before you discover that you can). I was SOOOO excited when I saw how my music rules printed out. I did not know if the watercolor would print well or if the music noted I added to the background myself would show up well. It's my favorite set yet! I have a little rule for each song that makes learning these rules really fun the first week of school. You can find these rules posters and the corresponding songs here. 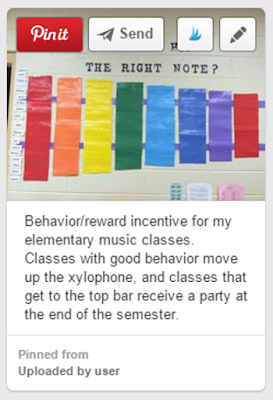 I loved the idea of having a colorful xylophone on my wall as a way to track class behavior. Each day when my kids line up, we go over the music room rules and see if we followed all five as a group. If they did, they earn a 5 star day and get to move their class clip over one bar on the xylophone. When they reach the top bar, they will earn a free day for their next music class. Free days in my room are singing games or children's literature that were their favorites from the year or previous years. I didn't have as much space on my wall as the pinner, so mine is a much smaller version above my counter and below my cabinets at the back of my room. For my big bulletin board I wanted to do something that incorporated paint chips and the saying "Each individual is like a single note. Together we create a masterpiece." My sister in law painted the staff on my light purple fabric for me. I already had the black die cuts and the green paint chip die cuts are from the same "painted palette" line as the borders I used. You can find them here in lots of colors. I got the idea from a combination of several pins on Pinterest, but instead of using a die-cut for each note, I wanted the note heads to be the kids thumbprints. I used acrylic paint and about 8 minutes per class period. Each class all used the same color so I wasn't having to switch colors or brushes during one class. I used a brush to get the right amount of paint on each kid's finger. They went straight to the board, made their print in a place of their choosing and immediately wiped their finger clean with a Clorox wipe. At the end of each class, I had one student go clean the brush and cup for me and fill the cup with clean water (grades 2-5). I had a couple extra brushes so when it was kindergarten and first grade back to back, I didn't have to worry about having the brush cleaned. The brushes pictured worked perfectly for their fingers. For K-2 I cleaned their fingers with the Clorox wipes myself. It still didn't take much time at all and went much smoother than I anticipated. The kids got excited when they came in the next time and saw even more colors added to the board. This board represents half of my school The other half will be adding their prints on Monday. As I am posting this, I just realized I was trying so hard to get close ups of everything that you don't see the room as a whole. I will see if I can do a view whole room shots next week for you! I hope you have enjoyed this little tour of my music room. If you used any of my decor in your music room, I would love to see pictures. I have started a photo album on my Facebook page of classrooms around the world using my creations. I am slowly getting pictures you share added to it! Thanks for stopping by! I hope you have a great year! The watercolor stuff is beautiful! Thank you! I am finding it really calming! 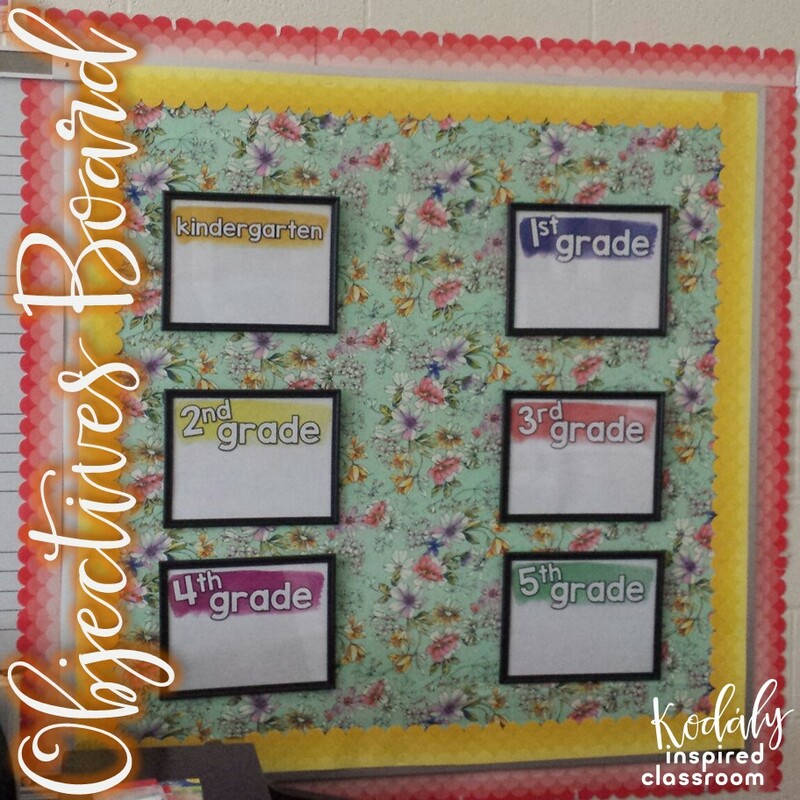 Beautiful blog design AND classroom! Gorgeous music room. I love the watercolor theme! Love, love love it! Such a beautiful concept and it looks fabulous in your room. I love that your blog fits the theme too. Clever! Thanks for linking up! Thank you so much! I am so happy with the way my room and the new blog design turned out! Thanks you so much, Jen! I am really happy with how it all came together!